One concept I like when I’m thinking of complexity is the Cynefin framework developed by Dave Snowden (see the picture on the right). I mentioned the framework already in one of my answers to the comments of the last post on ‘What is complexity?’. The beauty of the framework is that it helps you to categorize problems in simple, complicated, complex and chaotic. Furthermore, it gives you a strategy for each of these domains how to design your problem solution. For example for complicated problems the strategy would be ‘sense – analyze – respond’, meaning that first you have to sense the problem, analyze the system (or call in experts who know the system) and respond based on the analysis. I do think that it makes sense to differentiate between the four domains. The problem really is that in the past we treated many problems that are actually complex as only complicated or even simple problems. Also in international development. In order to categorize these problems as actually being complex, we need this sort of frameworks and guidance how to approach them. I realize that I use the word categories here. Now if you listen to the video on YouTube where Dave Snowden introduces the Cynefin framework, he makes it quite clear that this is not a categorization model, but a sense-making model. A categorization model, in his explanation, is model where the framework precedes the data. That means that the data can be filled in quickly into the existing model – with the risk to lose out on the subtleties. A sense-making model on the other hand is one where the data precede the framework. Here, “the pattern of the framework emerges from the data in a social process”, as Dave Snowden puts it. But I think it is easiest if I let Dave Snowden introduce the framework himself. Have a look here at the YouTube movie. For more information, there is also a Wikipedia page on the Cynefin Framework. 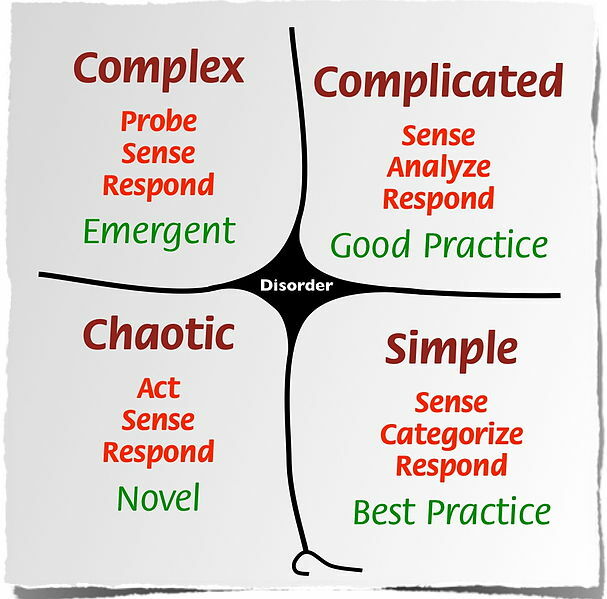 This entry was posted in sense-making and tagged chaotic, complex, complexity, complicated, cynefin, dave snowden, simple on October 28, 2011 by Marcus Jenal.